An Idaho state representative’s Facebook post of herself proudly posing with a Confederate flag has touched a nerve in the state, which still resents being associated with the racism of Richard Butler’s Aryan Nations. 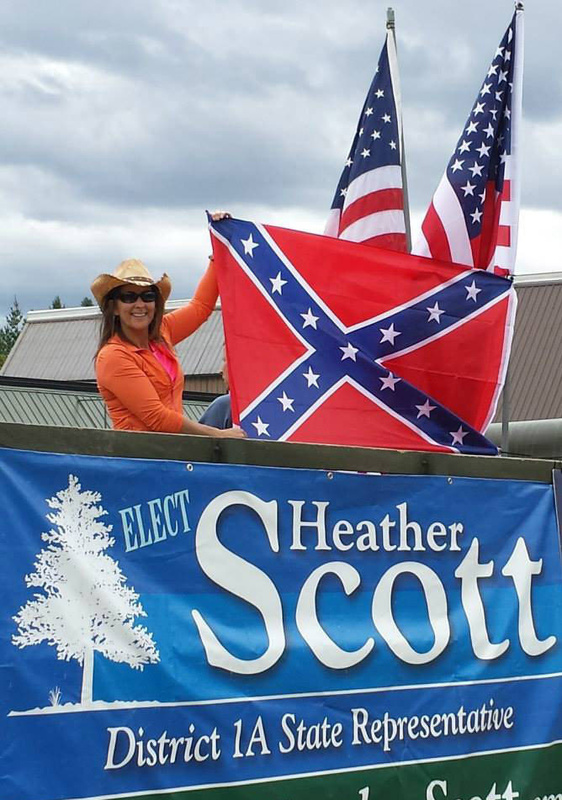 Rep. Heather Scott, a Blanchard Republican, posted the picture on Facebook along with the message: “Protecting and promoting our freedom of speech is an honor.” The photo, which includes her campaign sign, was taken at Priest River’s annual Timber Days celebration on July 25. Flags have been potent symbols in North Idaho’s experience with white supremacists. In 2004, when an 86-year-old Butler held his last neo-Nazi parade through downtown Coeur d’Alene, he rode in the back of a pickup flanked by two Confederate flags, along with swastikas. The flag of Israel dragged on the ground behind the truck, and at one point, some of Butler’s skinhead supporters stomped on it. Scott’s Facebook post came two weeks after South Carolina lowered the Confederate flag permanently from its state Capitol, after 21-year-old Dylann Roof posed with the flag before gunning down nine black churchgoers in downtown Charleston in June. Priest River Mayor Jim Martin said he never noticed the flag at the parade. “I saw the truck with her signs on it down when we were lining up, but that was about it,” he said. “I think that things like this will lead to people in other areas characterizing us in a certain way because of the history that we have in North Idaho, and then you have one of your elected officials hoisting a Confederate flag. She has every right, for freedom of speech and all that stuff.” But, he said, “Personally I think she could have used something else to represent her stand for free speech.” You can read my full story here at spokesman.com.